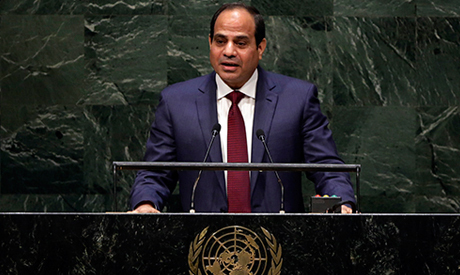 Egypt will present its views on various issues during President Abdel-Fattah El-Sisi's visit to the UN General Assembly, said presidential spokesman Alaa Youssef, who added that the country is keen on participating fully in Assembly activities. Youssef said in press statements in New York that El-Sisi is set to meet with Palestinian Authority leader Mahmoud Abbas on Sunday to discuss the latest developments in the Palestinian occupied territories. The spokesman also stressed that Egypt maintains its position that a political solution is needed for the Syrian crisis in order to stop the bloodshed and maintain the unity of the country. Youssef pointed out that the Syrian issue will be a main focus of El-Sisi's speech at the General Assembly. He also stressed that Egyptian-US relations are of strategic importance and that the two countries are keen on working together for progress in the coming period. He did not, however, confirm whether El-Sisi will meet with his US counterpart Barack Obama. The spokesman described the relations between the two countries as "excellent" and that they have been witnessing "positive development". El-Sisi is expected address in his speech on Friday topics including political and economic developments in Egypt, as well as Cairo’s position on regional issues in the Middle East, according to government spokesperson Hossam El-Qawish.